Editor’92s note: This is a continuation of our spotlight series on the mobile touch web.’a0 Last week, we discovered how ESPN keeps us informed on our favorite sports teams and matches. This series highlights the best mobile touch websites on the web.’a0 To see related sites and more great touch friendly content for any subject including fashion, men’92s interest, news, and so on; go to Taptu.com on your mobile device and choose ’93Categories’94.’a0 There you will see a resourceful list of the sites designed for your mobile touch phone. Anyone who has been online in the last 15 years knows about eBay.’a0 The online auctioning site has been around so long on the Internet that the site is a part of mainstream American life.’a0 In fact, Joe Six-pack, when he/she wants to sell or buy an item knows that eBay is a go-to resource. Even though eBay might be a dinosaur in the fast-paced online world, they are embracing the mobile touch web in an innovative way that stands out amongst other touch websites. 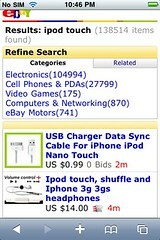 If you visit eBay.com on your touch device, you’ll see that the interface presents what any eBay visitor would expect: a search box to find the item you’re seeking quickly and easily, and the ability to log in to manage your account via My eBay.’a0 There’s no fluff or other unnecessary items to clutter the interface, merely a complete use case that fulfills 95% of every user’s intent when visiting the site. On the search results page, the specialized user experience continues.’a0 Users can view related categories or dig into individual items, based on the search query.’a0 Images are provided, and sized perfectly to give an impression of what the item represents along with a description that informs a potential bidder with relevant auction information including current price and time left in the auction. 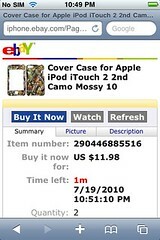 On the individual item page, you are presented with 3 options including bid (or buy it now), watch, and refresh the page.’a0 again, this brings the third step in the process for finding an item on eBay and does so in a clutter-free and finger friendly manner. 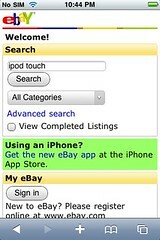 In effect, with their mobile touch website, eBay has made it drop-dead simple to search for, narrow down, and bid on any eBay auction, all from your mobile device.’a0 By carefully composing the use case for a mobile user, they’ve developed an experience that embodies the best of the mobile touch web.’a0 eBay’s design is clean and well-executed.